A latest release from the top name in tour hybrids, the Adams Golf Idea Pro a12 Hybrid is designed for versatility and playability on the course. Designed for tour pros, the a12 hybrid puts the industry’s leading hybrid technology into the hands of amateur players. Adams Golf has a long history of club design and production, and the company continues to win awards specifically for their hybrids. Known as the top name in hybrid technology, Adams Golf hybrids are used by more tour winners than any other hybrid. Even casual players will appreciate the performance enhancement that their easy-to-play hybrids bring to the game. 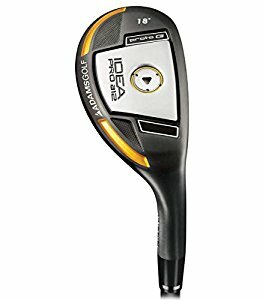 Adams Golf Idea Pro a12 Hybrid, a tour-caliber club, is part of the company’s Idea Pro line, clubs that have received significant media attention and praise. This new hybrid from the world leader in hybrid technology boasts improvements in its face and sole. The a12 hybrid has an even hotter steel sole than previous hybrids, which produces faster ball speeds and better flights overall. Its sole has been slightly re-designed to include a steel skid plate and flush sole weight to reduce drag caused by the club’s interaction with the turf. A number of features set this club apart as a tour hybrid. Most notably, its black finish is often preferred by pros because of the ability to reduce glare. Also, this hybrid has a small overall shape than other hybrids that are targeted at beginners; its smaller footprint and more aerodynamic shape gives experienced players more precise control over the ball. Adams Golf Idea Pro a12 Hybrid is outfitted with an Aldila RIP VS Proto Hybrid shaft for strength and handling. Plus, a Golf Pride New Decade rubber grip ensures a comfortable hold on the club. The Adams Golf Idea Pro a12 Hybrid gets an outstanding rating of 4.8 stars out of 5 stars. With near-perfect scores for quality and performance, the a12 hybrid is sure to deliver the kind of long-term use that is expected from the popular Adams Golf name. Some of the comments have included, “Overall, these are fantastic clubs that are probably the best hybrids out there, especially for better players” and “Seriously has taken 5 strokes off my game by this addition to my bag.” Experienced lady golfers will appreciate the advanced tour-inspired features of this hybrid.